Besides the introduction of a whole new user-interface, Ice Cream Sandwich brought functional upgrades to Android such as Beam and Face Unlock. Now, Face Unlock is certainly not as secure as a PIN or alphanumeric password, but it provides a good level of security and has a a lot of novel value. Face Unlock is, of course, exclusive to Android 4.0 Ice Cream Sandwich but with a new app called FaceLock for apps, you can get not only all of Face Unlock’s features in Android 2.3 Gingerbread, but also extra features that Google’s app doesn’t offer at all. Check it out after the jump! 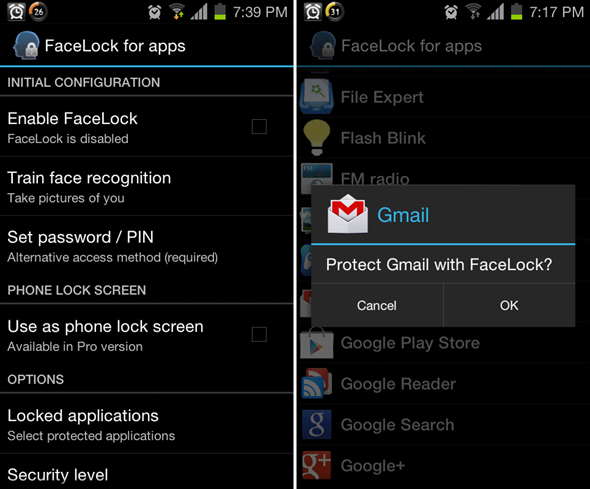 Developed by SmartApps Mobile, FaceLock for apps lets you protect your apps using your face. The only way to unlock them becomes your own one, unique face. It also offers Face Unlock’s feature where you can unlock your device (not just apps) with your face. Launching the app brings up its preferences menu from where you can choose from wide variety of options. 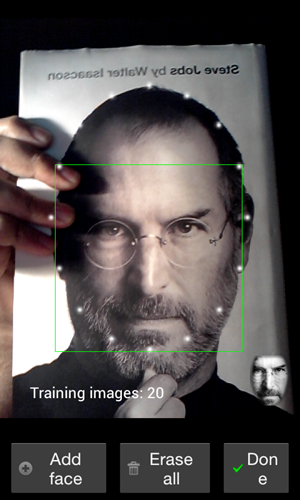 Before enabling the app, you are asked to train face recognition by taking at least 7 photos of yourself in different angles and, preferably, different lighting conditions. You are also asked to set an alternative PIN or password that will let you unlock your device in case it has troubling identifying your face. Once training is complete, you may enable FaceLock. By default, it locks access to sensitive apps such as Settings, Task Manager and Market, but you can of course choose your own installed apps also. On the free version [Google Play], you can only choose one app of your choice but the Pro version lifts this limitation. Speaking of the Pro version [Google Play], you can also use FaceLock as your phone’s lock-screen (just like Face Unlock). Besides this, it comes with extra features like the ability to set pattern lock as an alternative access method, more locking options (e.g. delayed lock), hide notifications and also set Face Unlock to launch on boot. We’ve tested the app on a Samsung Galaxy S II (Android 4.0.3 ICS) and can confirm that it works as advertised. Whether you’re on Gingerbread or Ice Cream Sandwich, we highly recommend you check out FaceLock! Thanks Jason for the hat tip!